Uses : The bark is sweet, cooling and tonic. It is good in vitiated conditions of Pitta, cough, asthama. It is useful in fevers, urethrorrhea, diaphoresis, convulsions, chronic laryngitis, jaundice and arthritis. 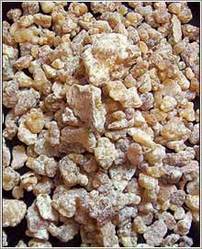 Gum resin is antiseptic, expectorant, antiinflamatory and diuretic in nature. It also helps in the treatment of bronchitis, diarrhea, jaundice, ringworm and other skin diseases.